Justin Rose conquered another historic venue on Sunday. This time, it was the Colonial Country Club in Fort Worth, Texas, that eventually bowed to the masterful iron work of this Englishman. Rose won the longest-running US PGA Tour event at its original site with a 20-under par final score and a 6-under 64 finishing round. U.S. Open champion Brooks Koepka finished second, three shots back, on the same course where Ben Hogan won five times. This event has played on this course since 1946. 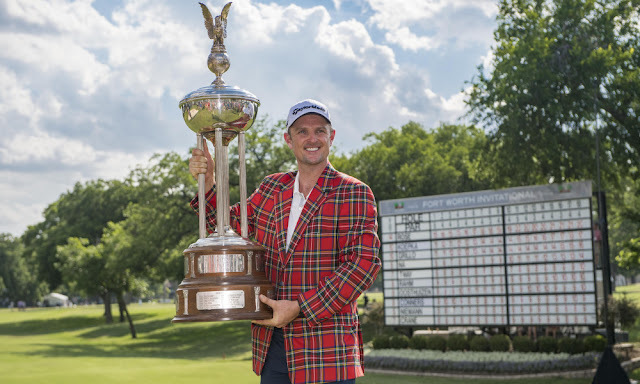 The Fort Worth Invitational went without a sponsor this year, but has secured a four-year deal with the investment firm Charles Schwab starting in 2019. “If you are able to win at a course that has great history, has had great champions, and if I begin to look at the courses I’ve won at, this definitely strengthens that group even more,” Rose said. The victory elevated Rose to No. 2 in the FedEx Cup standings. “When you’re in that rarified air in the FedExCup you start to think about positioning yourself in the Top 5 for Eastlake. We all know that’s that big, big deal. It’s a golf course I have played well at in the past,” he said. Among the other venues which have been fallen to Rose: Muirfield Village in the 2010 Memorial, the 2013 U.S. Open at Merion, the 2014 Scottish Open at Royal Aberdeen Golf Club, and the 2007 Volvo Masters at Valderrama in Spain.